Description ↴ This locket has the design of the Shri Yantra, inscribed on the surface of a naturally occurring crystal, known as 'Safaitik'. The literal meaning of the word 'Safaitik' is pure, as it is a very pure material and well suited to enhancing the powers of Yantras, this crystal is also known to have a calming effect. 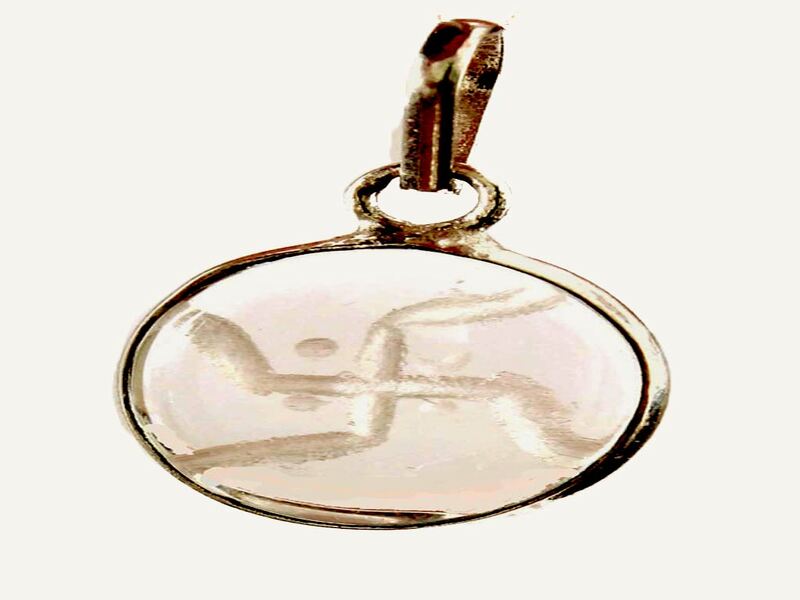 The talisman is held in a solid silver frame, with a solid silver hook and will bring wealth, success, good fortune, peace and harmony to the wearer. PowerFortunes.com crystal lockets are made of a solid piece of natural crystal, known as 'Safaitik'. This is similar to quartz. Each locket contains about 10g of crystal. This crystal is completely transparent, but minute viens may be visible. The crystal talisman is held in a solid silver ring. The complete locket has smooth edges and a flat back. The talisman grid is etched in to the crystal, by hand. This is very light, has no noticeable weight and is comfortable to wear. This locket is strong and will not flex, break or distort without the use of considerable force. Our locket talismans are ready to wear, a silver ring is provided at the top, so that they may be attached to standard chain, necklace or thread and be worn either inside or outside your clothes. The locket may be polished with brass/silver polish or natural oils, like jasmine, coconut or olive oils.